Professor Ansari's research is in experimental Biophysics. She has worked extensively on characterizing the conformational dynamics of proteins and the kinetics of relaxation from a non-equilibrium ensemble of conformations. Current efforts in her laboratory are directed toward understanding the principles behind secondary structure formation in single-stranded DNA, RNA and proteins, with the application of theoretical and computational models from statistical mechanics of polymers to better understand the experiments. She uses time-resolved absorbance and fluorescence measurements following a 10 nanosecond laser temperature-jump to probe the dynamics of the biological macromolecules. 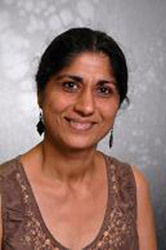 Professor Ansari received the National Science Foundation CAREER award for her research in 1998. A. Ansari, Y. Shen, and S. Kuznetsov, Phys. Rev. Lett. 88, 069801 (2002). Y. Shen, S. V. Kuznetsov, and A. Ansari, "Loop dependence of the dynamics of DNA hairpins," J. Phys. Chem. B. 105, 12202-12211 (2001). S. Kuznetsov, O. M. Sidorkina, Y. Shen, J. Laval, and A. Ansari, "Characterization of thermal stability of a DNA repair enzyme, the Escherichia coli formamidopyrimidine-DNA glycosylase," Biochem. Biophys. Res. Comm, 288, 121-128 (2001). S. Kuznetsov, Y. Shen, A. S. Benight, and A. Ansari, "A semi-flexible polymer chain model applied to loop formation in DNA hairpins," Biophys. J. 81, 2864-2875 (2001). A. Ansari, S. Kuznetsov, and Y. Shen, "Configurational diffusion down a folding funnel describes the dynamics of DNA hairpins," Proc. Natl. Acad. Sci. USA 98, 7771-7771 (2001).